Lot Detail - The Man with Two Faces. Wyatt, Snap. 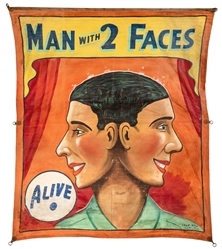 The Man with Two Faces. Tampa: Snap Wyatt Studios, ca. 1950. Wooden batten at top. 144 x 120”. A few tears and holes; good overall.